On Sunday morning, I woke up with a sore throat, stuffy nose and a headache. Ugh. I was getting sick and I know that when I get sick, I overeat. I know it's common for people to do the opposite, and not eat as much when they are sick, but I think I seek out food as a comfort thing; to try and make myself feel better. I need to work on that, which is why I'm sharing this with you. As I was mindlessly eating to make myself feel better this past Sunday, I had a thought that stopped me dead in my tracks. I thought, "I can't do this to myself. I can't do this to my team! I am participating in a HealthyWage challenge, whether I have sick days or not. 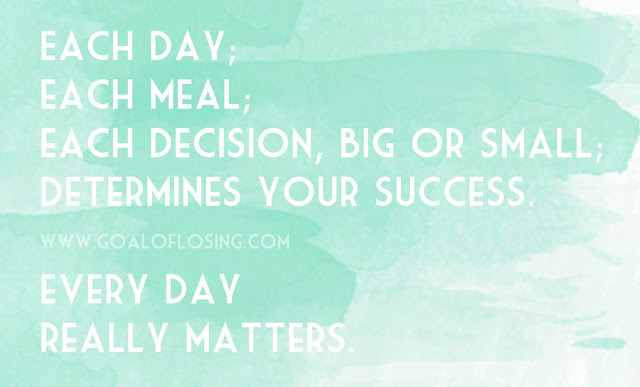 Every single day really matters right now!" Then, I grinned to myself as I thought about what I had just said to myself again; "every single day really matters right now?". What? Shouldn't it be that every single day matters, period? So, I let myself think about that more. Sure, it's true that every day matters in a sense that your choices define your success regardless of whether or not you're participating in a weight-loss challenge. I just think that I'm realizing it more now that I have the positive pressures of (1) an impending deadline, (2) a clear goal and (3) a team that I can't let down. Without a deadline for my weight-loss goal, I use to tell myself that I'd do better tomorrow and continue on an unhealthy path of over-eating for basically no reason at all. It is true that if you do unintentionally go off track, you can do better tomorrow. There is a balance there; it's just that having this challenge gives me more of a reason not to go off track, if I can reasonably avoid it. When you have a deadline to reach your weight-loss goal, you only have so many days to "make it count" toward your goal. Each day; each meal; each decision, big or small; determines your success. This is also true in general, it's just harder to realize without the pressures of that deadline. I'm well into my second week of the HealthyWage challenge, and by participating in this challenge, I can already see where I have more incentive to stay on track. I've got money on the line, and I have a team that I can't let down. That alone makes me think more like, "this meal can either go toward my success or against it", each time I go to choose what I'm about to eat. So, even though it is very true that every day really matters regardless; I just feel it more during this weight-loss challenge, than ever before. Want to learn more about my HealthyWage Challenge? Read more, here: Goal of Losing's HealthyWage Challenge. I also work better when I have a deadline!!!!! !